Hedychium putaoense Y.H. Tan & H.B. Ding. During April to May in 2017, a team from Xishuangbanna Tropical Botanical Garden (XTBG) and Institute of Botany, the Chinese Academy of Sciences (IB-CAS), in collaboration with the Forest Research Institute of Myanmar, conducted field work in northern Myanmar to survey plant diversity. During field work, a new species of Hedychium were found. 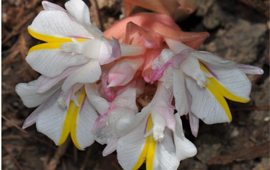 The species is named after the type locality, Putao District in Kachin State, Myanmar, Hedychium putaoense Y.H. Tan & H.B. Ding. Hedychium Koenig, commonly called as “ginger lily” or “butterfly lily” produces one of the most beautiful and fragrant flowers in the gingerfamily Zingiberaceae.There are approximately 70-80 known species, native totropical andsubtropical Asia. Hedychium is characterized by flowers with very long (rarely short) filaments, dorsifixed anther, and usually fragrant flowers.Members of the genus could be easily recognized by its showy, numerous-flowered terminal spikes, some of which have been cultivated worldwide. On the top of the mountain from Masabu village to Namti village, some interesting specimens of Hedychium were found. 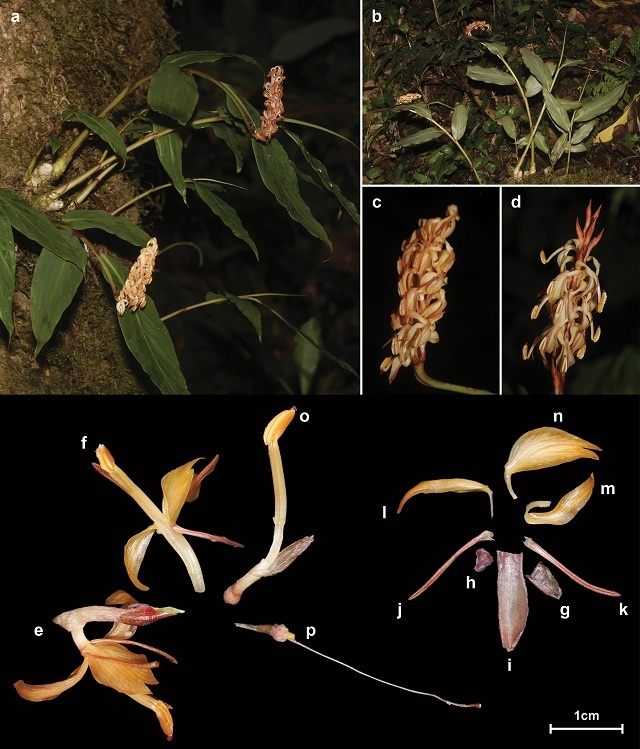 Based on detailed examination of the morphological characters of our material and possible closely similar species, we draw a conclusion this specimens of Hedychium collected in Myanmar belong to a species new to science. According to its type locality, this new species is named Hedychium putaoense Y.H. Tan & H.B. Ding. Hedychium putaoense Y.H. Tan & H.B. Ding is similar to H.densiflorum Wall. and H. longipedunculatum A.R.K. Sastry& D.M. Verma, but differs by its very small bract and bracteole, orange flower, lanceolate lateral staminodes, filament intensely curved towards tip about 180° and dark red stigma. This work was financially supportedby a project of the Southeast Asia biodiversity research institute, Chinese Academy of Sciences(Y4ZK111B01). Hedychium putaoense Y.H. Tan & H.B. Ding. a–b Habit c–d Inflorescence e–f Front and lateral view of flower g Bract h Bracteole i Calyx j–k Corolla lobe l–m Lateral staminodes n Labellum o Corolla tube with anther and calyx p Ovary with pistil and glands. Photographed by Y.H. Tan & H.B. Ding.